There has been a strong desire amongst Solent Forum members to find solutions to the many barriers which are preventing the effective use of dredged material to augment Solent intertidal sites and, hence, to provide other benefits associated with such restoration work (especially enhanced coastal protection). The Forum’s role will be to manage the project and facilitate future communications. For more detailed information please download the BUDS Terms of Reference. Develop a strong feasibility case for undertaking significant ‘regional flagship’ beneficial use project(s) in the Solent, and enable the implementation of that project through further phases. Develop a love mapping system so that receiver sites can call for sediment. Ensure that there is a collaborative exchange of lessons between the regional work of the Solent Forum and other initiatives being undertaken at a national level by parties such as the RSPB, MMO, ABPmer or The Crown Estate. Specifically to ensure that the work leads to systems (such as the love mapping system) that can be replicated and that protocols and guidance are developed. This work should build on a wealth of information much of which relates to the Solent including amongst others work from the River Hamble Harbour Authority, the University of Southampton and Lymington Harbour. It is important that the work does not replicate previous work and that the budget is used to further the delivery of beneficial use projects. It will only be possible to make real advances in the Solent if the benefits of the re-use of dredging material is really understood and costed, and these benefits are aligned to objectives of regulatory bodies and coastal managers. The project comprises three phases. Download the project brief. Literature review of previous Solent work, issues, challenges and constraints, including understanding of national context and drawing upon past review work. High level review of beneficial use projects in Solent. Some detail required on criteria for assessment, and how to measure efficacy, using best practice and lessons learnt of projects elsewhere. Create a high level strategic GIS planning map of Solent dredge locations and disposal sites and areas of potential value for recharge work. Building a stakeholder network for the exchange of information (the project group is the core). Survey relevant Solent Authorities and stakeholder network for potential donor material and receiver sites. High-level feasibility study including cost benefit analysis and costing of proposals to undertake beneficial use project (highlighting the range of beneficiaries). Develop options for the Solent for a project(s) for beneficial use within a set time period and for preferred options to develop full feasibility plans for actual use of dredging at some key sites. 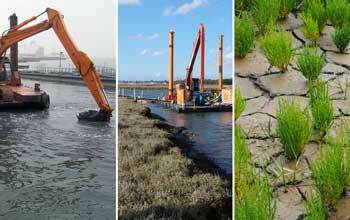 Key site selected: Western Solent and Lymington Marshes. To consider whether a scheme may be a one off or one that can be repeated. This study would detail exact timings and costs of sources of sediment to match with receiver site needs. It would identify funding sources for complete projects. The beneficial costs will be firmed up so as to fully calculate cost benefit. Licences and permissions to be fully scoped ready to obtain. EIAs conducted. Updated detailed cost benefit analysis required as well as technical analysis of recharge techniques and efficacy. Consider Replicability – buying in the necessary kit for all sites. Benefits of scale. Pump, monitoring system. Explore funding for phase 3 and develop tender material. Develop and understand lessons learned on maintenance dredge and disposal licensing. This could lead to a protocol and guidance. To feedback the mapping of Solent dredge locations and disposal sites and areas of potential value for recharge work to national players. To provide detailed matching analysis. Timetable: January 2019 to March 2019. Beneficial use of dredgings projects in the Solent.